Whatever kind of sport you play, mental toughness plays a vital role in how the end result of the game would be. How you are prepared mentally to go through and play under pressure would certainly be a key in how the outcome of the game would be decided in the end. Remember, success or failure starts in the mind. If you believe you can’t do something, it will be difficult for you to do it at all or do it well. This is very true when you play golf! The best golfers are those who play with the right mentality, those who refuse to be intimidated, who believe they can win and go ahead and do all they can to win. Every player knows that what separates the good from the elite are the mental aspect of golf. You know this is exactly true! Sure, there are the issues of natural talent, starting golf instructions at quite a very young age with excellent coaches, disciplined practice, strength and conditioning and pure determination. However, in pressure-packed situations, only the person who has the best mental approach to playing golf would go on as the winner. That is why mental preparedness and golf mental toughness is a skill that you should develop as part of your game. The right mentality can be cultivated and learned you know! For this reason, we will talk about and review in this article an e-Book guide towards developing the mental part of your golf game – the Renegade Mindset Techniques For Golf eBook! What Is The Renegade Mindset Techniques For Golf? The Renegade Mindset Techniques For Golf is a completely downloadable product (actually, a combination of an eBook and audio files) that will teach you everything you need to know and provide you excellent mental tips for golf to ensure your golf game is at its best. The product creators, Stephen Ladd and Bill Gladwell, have over 37 years of intense personal and professional study into the mind-body connection including four academic degrees, dozens of internships with the most respected authorities in the sports and personal change arenas. They also have had extensive travel throughout southeast Asia in search of more substantial (and certainly lesser known) answers to the question of which techniques do champion athletes use to gain the mental edge over their opponents. Renegade Mental Techniques For Golf is a coaching system that will attack your mental roadblocks and get you into peak performance form. The authors don’t waste your time with any fluff. From the first page through the last MP3 Hypnosis session, you’ll learn the best insider-secrets to mastering the mental game of golf. What Makes The Renegade Mental Techniques For Golf System Works? There’s therapeutic hypnosis where you are placed in a deep trance where you lose track of time and wake up later unaware of what you said or did. And last is waking-hypnosis. This hypnosis technique is what is used in the Renegade Golf System. You simply listen to Bill that puts you into a light trance. He uses the light trance to convince your subconscious to start working on improving your golf game. At the end of each session you’ll feel relaxed, focused and ready to play a serious game of golf! The authors adapted the powerful science of Neuro-Linguistic Programming to Golf. This is the same system that Anthony Robbins uses to turn NBA Players into foul-shot whiz kids and gives elite Olympic athletes the Gold medal edge. They’ll show you how to use simple NLP techniques to sharpen your focus, isolate your mental roadblock, and experience game-changing breakthroughs. The authors will show you how to induce a state of profound relaxation and mental focus with just your fingertips (It’s like acupuncture but doesn’t require the needles) – so you’ll get into the zone pretty easily. Being a great golfer starts with having the right mentality. This can be cultivated by learning the techniques that enables you to optimize your golf brain. Program your subconscious mind for golf success. If you really want to improve you golf game, slash your handicap and shock your golf buddies, you need to check out this Renegade Golf Psychology System. 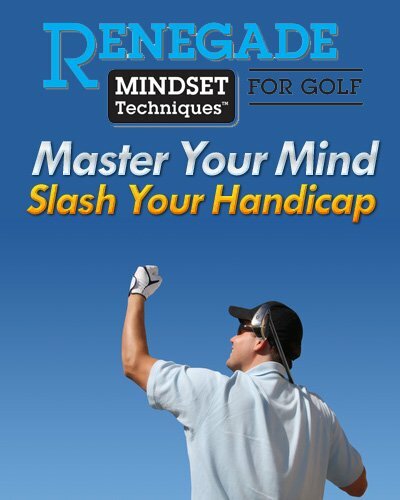 Click here to IMPROVE YOUR MENTAL TOUGHNESS NOW with the Renegade Mindset Techniques For Golf!